Home » Call to Action » AVA: Hit with a wooden bar and left to rot alive for TWO YEARS!!! We received a telephone call a couple of days ago… a woman wanted someone to do something for her neighbour’s dog. She was horrified and she was begging for help. We asked her to send us a picture and she sent us THIS!!! We couldn´t believe our eyes. At first we couldn´t really understand what we were looking at. We were in tears… so immediately we phoned and asked for more details. Apparently someone hit AVA on the face with a wooden stick two years ago. 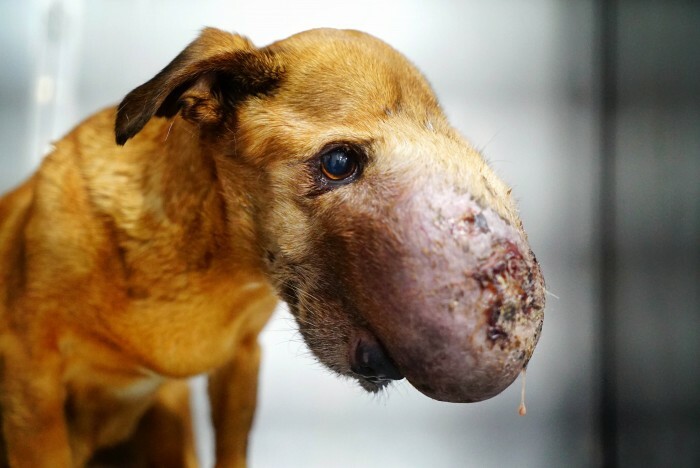 During this time she was denied treatment, and progressively got worse.. and worse… and now she was clearly rotting away and their home smelled bad, so the owner wanted to get rid of her..
Our shock was huge, knowing how AVA had been suffering all that time. Two years of brutal pain, her face swelling, infection eating her bones, muscle, tissues away… Her pain… it´s beyond comprehension.